← Tulip time: Spend your money wisely. It’s a decision. This is my front yard. Remember my bulbs? Before I can plant them, I had to clear everything but my butterfly bush. The monarda, sedum, tulipa, achillea, rudbeckia, and whatever I forgot to name, plus any rocks I found, all had to be moved before Mr. TellBlast could till. He suggested tilling, because the ground is terribly hard with the drought. 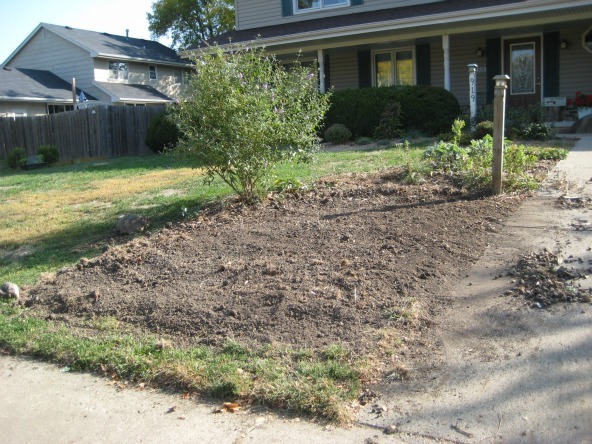 DS2 had previously extended this bed about 2′ closer to the sidewalk, and DS1 and I removed the ‘railroad ties.’ I have a lot of work ahead of me. This entry was posted in etc. and tagged garden. Bookmark the permalink.